Little is known about James Francis Dunn, a native San Franciscan, but if "God is in the details," Dunn's buildings are devoutly religious. 401 Baker Street, architect unknown, is a classic Queen Anne Victorian built around 1891. The house is listed in Here Today: San Francisco's Architectural Heritage and described as "unusually large and heavily ornamented in the spirit of the times [with] two Queen Anne corner towers, each expressing individuality in shape, size and culmination. 405 Baker Street, built in 1904, was designed by Dunn in an eclectic Mission Revival style. 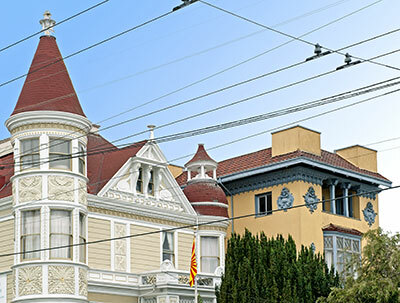 The Haight-Ashbury District is characterized by the juxtaposition of grand residences in many architectural styles popular in the late 19th and early 20th centuries.